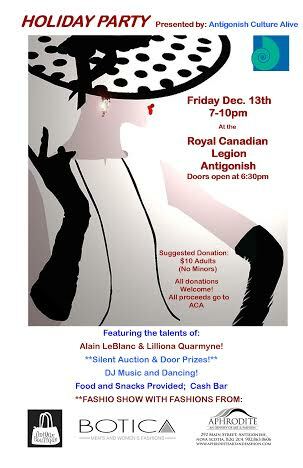 « A GRAND ACA HOLIDAY PARTY THIS FRIDAY! Due to the heavy weather today – Sunday Dec. 15, Aphrodite will not open. Instead, I will prepare a new post featuring photos from the great ACA event last Friday. Stay tuned – and stay warm and cozy today. Gotta love that white stuff! This time Aphrodite has very little to do with the upcoming fashion show and event. We have opened our door to about a dozen artists who are creating their own fashion compositions from fashion retailers Aphrodite, Botica and the Unique Boutique. The last few days we’ve had a flurry of activity in the store starting with piles of garments (artist materials) accumulated in the dressing rooms by the artists (the artist’s studio) – followed by the trying on and selection process ( planning the composition) to the accessorizing (finishing touches). Even I was amazed by the groupings they created – they are way more original and expressive than anything we could come up with. It doesn’t end there. The music track for the show was expertly prepared by music aficionado Sam Kalman who will also do some DJ spinning at the event and to top it off we’ll have live dance and music performances by Lilliona Quarmyne and Alain LeBlanc. Don’t miss this very unique and original event planned by Antigonish Culture Alive – our regional arts council dedicated to promoting the extraordinary talent and culture of our town. Don’t miss it! It will be the place this season to see and be seen!